Happy Tax Day everyone. I always found the rushing effect of Tax Day to be pretty funny. You have weeks and weeks to prepare your taxes – why would you ever wait until the last day. I understand if you owe money and don’t want to pay but, jeez, you can only delay fate for so long. I am happy to say I did my taxes weeks ago so I will not be rushing to get them done today. Nor will I be enjoying any of the fast food restaurants deals of the day – Free Curly Fries at Arby’s, Buy One Get One for a Penny at McDonalds or All Day Happy Hour at Sonic. None of that for me. But, I will talk about a food item that is green. And what does green mean? Money. I really like M&M’s. I would certainly rate them pretty high in my scale of candy that I like. I’m not a huge candy eater by any means and I never sit down and eat a bag of M&M’s at one time. For me, it’s a few and move on. While Plain are totally my favorite, I do also enjoy the Peanut Butter and Peanut varieties. And, of course, trying out the new flavors. The Dark Chocolate Mint M&M’s came out a few months back and I got to try one or two at Christmas time. However, it was not until this past weekend that I really got to try them. And oh snap, they are surely money. Opening up the Mint M&M’s does not blast me with the smell of mint at all. I was not concerned with this in the least and was ready to dig in. As I poured a few M&M’s out, I was surprised to see that every M&M was different in size. This surprised me since the inside of the M&M did not contain an additional item – like peanuts or almonds. While all of the M&M’s are green, they do contain a few shades of green. Not grey…green – get your mind out of that gutter. Green…Like money…On Tax Day. For my first Mint M&M, I placed an entire one into my mouth and ate it. I was hit with the familiar chocolate shell of an M&M followed by a very thick interior. That was, of course, minty. 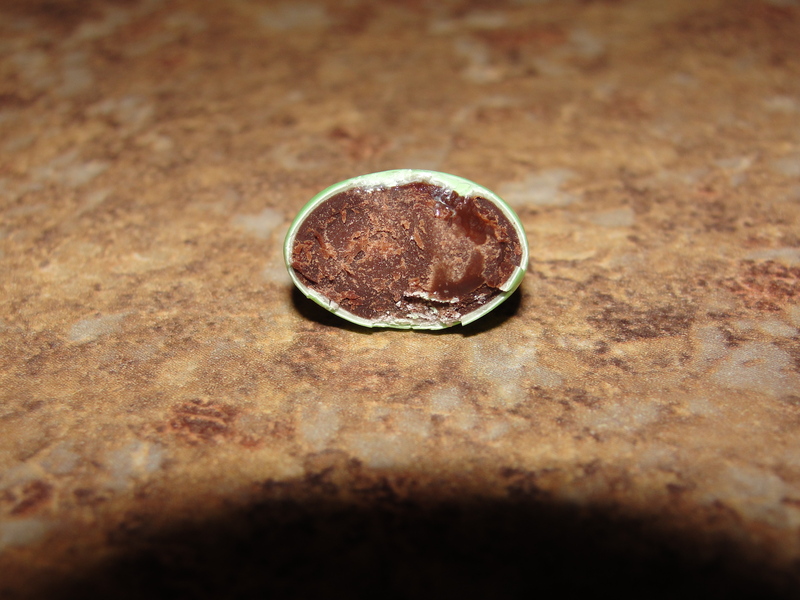 The chocolate inside the M&M shell was rich in flavor and very thick. The fact that it was so thick took away from the creaminess of it. The thickness of this chocolate really surprised me. Perhaps this was because it also contained the minty flavor? The mint flavor could be tasted while I was eating the M&M and then also when I swallowed it. I found it to be very refreshing and in no way overpowering. After eating one M&M, I had remnants of the flavor in my mouth and was ready for another. The mint reminded me of the mint in an Andes candy but of course the M&M was all chocolate. The mint meshed really well with the chocolate to produce a very tasty product. Neither the mint nor the chocolate won the match – they were content with working together for a mutual tie. While these M&M’s are labeled as dark chocolate, I would call this chocolate just on the verge of being dark chocolate. There was no bitterness in the flavor of the chocolate at all. I still really enjoyed the overall flavor of not only the chocolate core but also the chocolate coating & integrated mint flavor. Again, the thickness of the interior of this M&M was unlike any I have ever had before. This was fun and a great experience. After eating my few Dark Chocolate Mint M&M’s, I felt satisfied and happy with the end result. I think these M&M’s are going to be a sure regular in the M&M’s lineup. I can’t say if I will go out of my way to purchase these but, if I had them, I would eat them and probably enjoy them quite a bit. I am interested to see if anyone else has tried them and found the chocolate to be as thick as I did. Well, enough of this. Your break is done. You only have a few more hours to file your taxes. 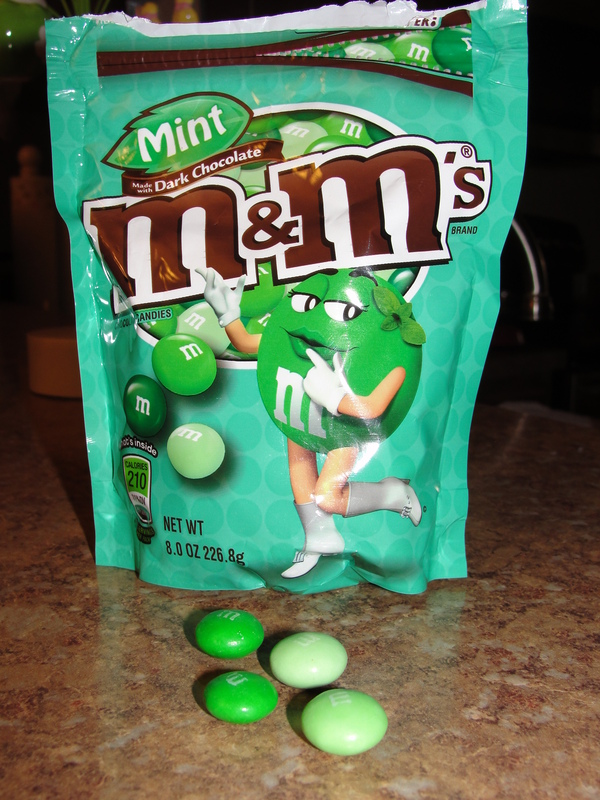 Then, go get some Dark Chocolate Mint M&M’s – they will surely be your Minty Green Money Shot for Tax Day 2012. I had a pack of these that my boyfriend bought (he’s a mint fanatic). I agree, they really were quire good!